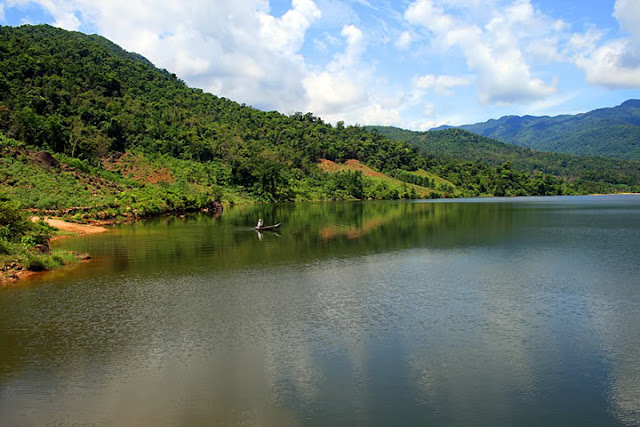 The An Lao mountainous district of Binh Dinh Province is an interesting destination to explore and admire. In the hot summer months when the tourist resorts and beaches are always overcrowded with visitors, the best solution is to visit peaceful places where are not known by many people but no less interesting to enjoy the summer in your own way. An Lao will not disappoint you. An Lao district, Binh Dinh province is a mountainous district located about 100km from Quy Nhon city center to the northwest. 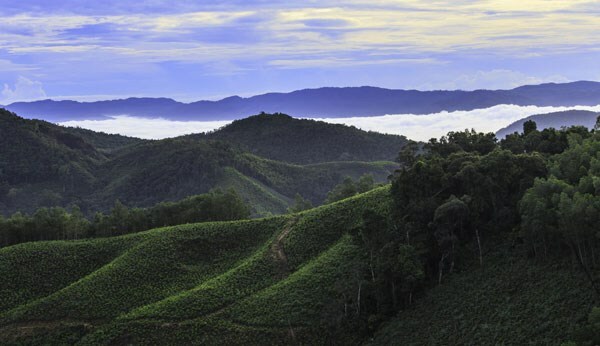 An Lao landscape carries the characteristic features of the mountains. The steep terraced fields, steep paths, steep winding mountain slopes are like the special challenges for the backpackers who are passionate about exploring the new land. If you want to conquer this area, you need to be skillful in riding motorbikes, and need to prepare all the necessary equipment when going to the forest to ensure the safety. From the center of Hoai Nhon district, you can travel straight toward Xuan Phong (An Hoa commune, An Lao) about 20 km, then turn and ride about another 5 km to reach the road leading to An Toan. Stopping at Milestone 10, visitors will have the opportunity to experience an exciting picnic trip. From the main road, visitors walk down the stream. Boulders stacked on top of each other, over time and affected by the flowing water create fancy shapes. At this point, the layers of stone are joined together as huge stairs and the water flowing down creates gentle small waterfalls. The big trees inclining along the sides of the stream provide shade for visitors to set up tents, set fire to grill food... After taking a short rest, nothing seems to be better than dipping under the waterfall, swimming in the lake which is deep enough and cool. If you want to conquer the waterfall, visitors can climb the mountain for another 2 km. There is a higher waterfall, a deeper lake, and a broader view. In Binh Dinh, the road leading to An Toan commune has long been famous, not only for its beautiful scenery but also for its small zigzag dirt roads crossing of forest, especially its slope. Many visitors have to say "oh, why is it so steep?" when experiencing this pass. If you do not want to walk, you should find yourself a strong enough motorcycle to climb the mountain or specialized car to climb. Of course, the driver must be experienced and skillful. The trails on the top of the hill, the green palm trees on the side of the forest, the flowers of the forest, the echoes of the birds, the murmur and the sound of waterfall ... create a wild and lively picture of the nature and makes people feel so peaceful. In particular, this place has a special species of fish which is very unique. 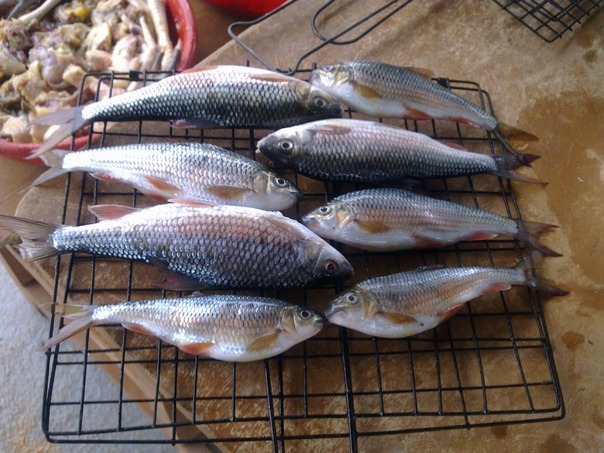 They only live in the flowing streams, more interestingly, they swim upstream, so the meat is lean, fat and has delicious bitter taste. In addition, there is also “dớn” vegetable (a kind of plant with the same family as ferns), people often call it "mountain squid". A lot of visitors are enthralled by these two favorite dishes. An Lao people are simple, rustic and especially hospitable. Experiencing many ups and downs of the history, used to be military bases, witnessing many of our nation's great battles during the revolution, An Lao is now changing every day. Its great love this information Now I am going to plane my next tour in Australia after reading this post.